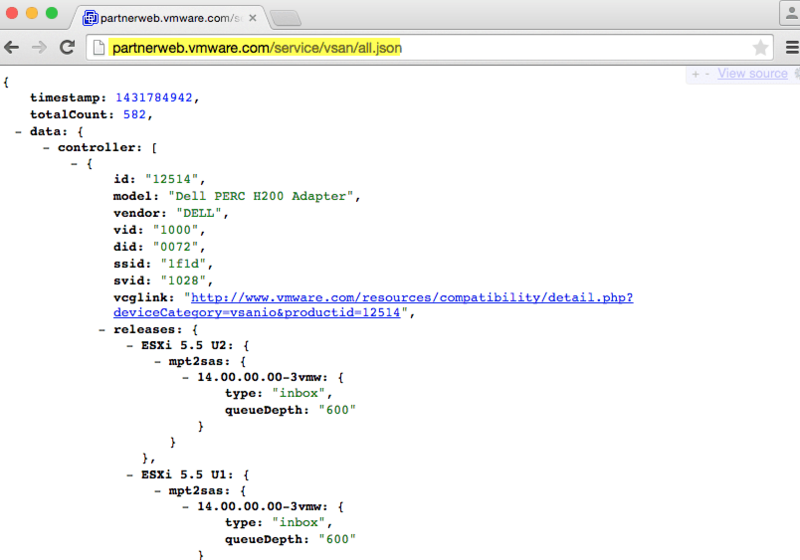 How to check when the VSAN Hardware Compatibility List (HCL) is updated? While catching up on emails from being out on paternity leave, I came across a VSAN HCL feature request that I had filed in early December of last year. I was pleasantly surprise to see that it had been marked resolved. The VSAN Hardware Compatibility List is continuously being updated to include new hardware platforms and components that have been certified by our hardware vendors. This of course is great news for our customers, but one challenge that I have heard on several occasion is how to keep up with the changes, especially the addition of new components? The VSAN HCL allows you to subscribe and get notification on individual components which is useful to get the latest recommendation. However, in the case of new components being add or even removed, there is no easy solution and most folks resort to manually checking the VSAN HCL by hand. 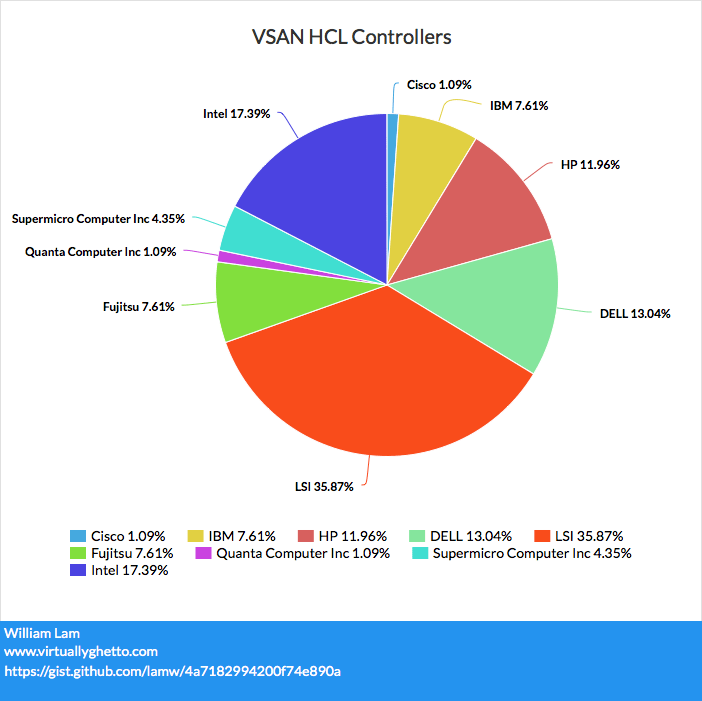 VSAN itself does include an HCL healthcheck, which you can have it directly pull the latest VSAN HCL JSON from VMware's website, although this may not always be possible for customers without direct or proxy access to the internet. This means for customers who may have dark sites, they must periodically download the latest VSAN HCL JSON and distribute that throughout their vCenter Server, where as a more ideal solution is to only push the update when a new JSON has been provided by VMware. My feature request was quite simple, it asks for a method in which customers can easily subscribe and get notified of when the VSAN HCL database has been updated. This has been delivered as a tiny RSS feed service. 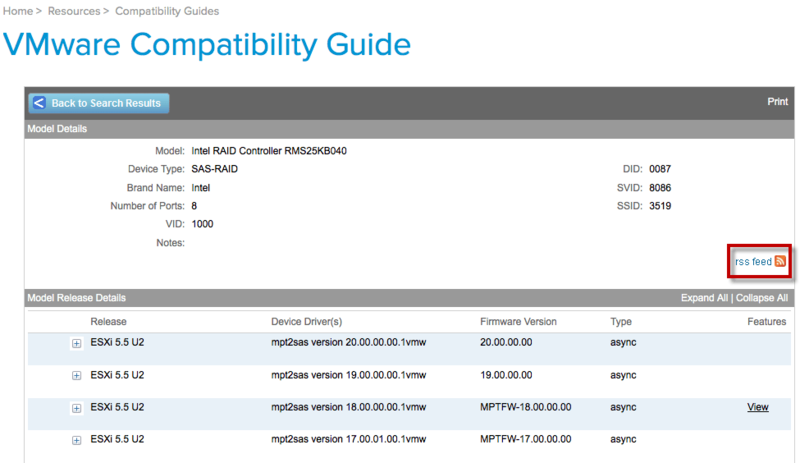 [Read more...] about How to check when the VSAN Hardware Compatibility List (HCL) is updated? How to download offline VSAN HCL file for VSAN Health Check Plugin? One of the coolest features in the new VSAN Health Check Plugin is the automatic verification of your underlying hardware (hosts, disks, storage controller & drivers) by automatically checking it against VMware's VSAN HCL (Hardware Compatibility List). To download the offline VSAN HCL file which is actually is just a JSON file, you just need to load the above URL into a web browser and then save the file. As a bonus, I also had some fun parsing the VSAN HCL JSON file. Below is a graph that I was able to generate after extracting some useful information using the following script found here. How to get notifications when a component on the VMware HCL changes? This was a surprise because it was something I was tinkering around with back in March (8months ago!) to see if I could some how generate notifications when changes were being made to a specific component/device on the VMware HCL also known as the VCG (VMware Compatibility Guide). I suspect many of you have used the VMware HCL at least once if not many more times and as you can imagine, it would be nice to be able to get notifications or alerts when something has changed for a particular component or device that you might care about. I was thinking about this problem because at the time I was interested in receiving updates on a particular VSAN disk controller. While browsing through the HCL, I had noticed there was an RSS feed icon located on the upper right hand corner for each component/device as shown in the screenshot below. I thought maybe I could do something interesting with that? I decided to use one of my favorite SaaS services IFTTT (If This, Then That) which I have blogged about in the past on how to send SMS notifications using vCenter Server Alarms. I found an RSS to Email IFTTT recipe and created a notification based off of one of the Intel RAID Controllers by specifying the RSS feed URL. I knew this was going to be a bit difficult to test given the HCL does not get updated that frequently and even if it does, I have to be monitoring the right device that received the update. I completely forgot about this recipe until yesterday when I had received the email stating an update had been made to this device. I guess it worked after all 😀 If there specific things you care about on the VMware HCL and you want to be able to receive notifications for any updates, you can create several IFTTT recipes that can either send you an email or notify you through some other method. I think this is a pretty nifty trick instead of continuously checking the VMware HCL every so often for changes, unless you are looking for brand new component/device that has not been added to the HCL.